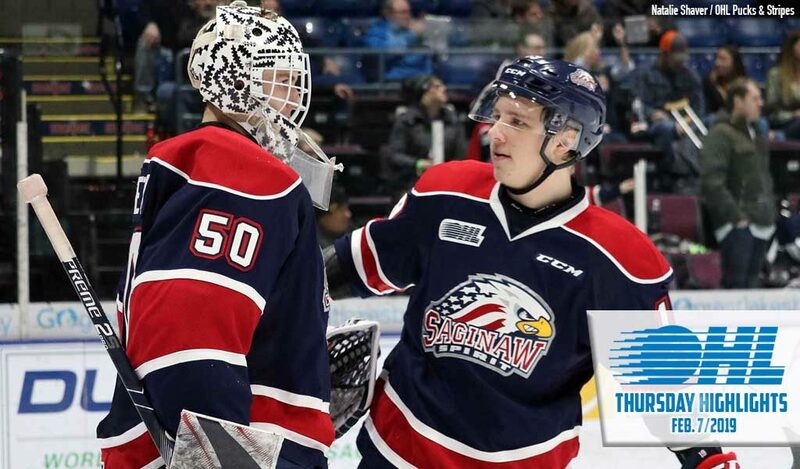 Cole Coskey (29, 30) scored twice, hitting the 30-goal mark on the season as the Saginaw Spirit pulled to within two points of first place Sault Ste. Marie in the West Division, defeating the Windsor Spitfires 4-1 on the road. Brady Gilmour (9) and Damien Giroux (20) also scored for Saginaw while Bode Wilde and Cole Perfetti each registered three assists. Arizona Coyotes prospect Ivan Prosvetov stopped 31 of the 32 shots that came his way as the Spirit earned their third straight win and eighth in the past 10 games. Rookie Jean-Luc Foudy (6) provided Windsor’s lone goal as the Spits outshot the Spirit 32-28 but came up short, falling to 21-28-3-1. Saginaw is now 33-14-2-2 on the campaign. The two teams split their eight-game season series with four wins apiece. The North Bay Battalion snapped a three-game slide in dramatic fashion, recovering from a 4-2 deficit as Justin Brazeau (46, 47, 48) netted a hat-trick in a 5-4 overtime win. Brazeau scored the game winner 3:36 into the extra frame as the Battalion edged the visiting Flint Firebirds. Luke Burghardt (6) finished the night with a goal and three assists while Matthew Struthers (23) found the back of the net and added a helper. Veteran defenceman Nick King racked up three assists on the night as the Troops outshot the Firebirds 40-31. Flint’s Ethan Keppen (21, 22) continued his strong play with two goals and an assist while Cody Morgan (6) and Jack Wismer (12) also found the back of the net. North Bay returns to the win column as well as the .500 mark, improving to 24-24-2-2 for sixth in the Eastern Conference. Flint suffers a fifth straight loss, falling to 9-40-4-0. The Ottawa 67’s let a 3-1 lead get away but recovered in a shootout to defeat the Peterborough Petes 4-3 on the road. Kyle Maksimovich (30, 31) inched closer to the 300 career point mark with two goals and an assist for the Barber Poles while Lucas Chiodo (23) had a goal and two helpers. Marco Rossi, Tye Felhaber and Maksimovich all scored shootout goals while Cedrick Andree picked up the win in goal, making 34 saves on the night. Erik Cermak (8), Adam Timleck (19) and Ryan Merkley (10) scored Peterborough goals as the Petes outshot Ottawa 37-25. Ottawa earns a ninth straight win, improving to 39-9-3-1 while clinching a spot in the 2019 OHL Playoffs. Peterborough earns a point but falls to 24-24-1-2, suffering their third straight loss. Cole Carter (30, 31) scored twice and Los Angeles Kings prospect Jacob Ingham stopped 29 of 30 as the Mississauga Steelheads skated to a 3-1 win in Niagara. Rookie winger James Hardie (11) also scored for the Trout while Aidan Prueter picked up two assists. Kirill Maksimov (32) ended Ingham’s shutout bid midway through the third period but that’s all the offence the IceDogs could come up with as they dropped their second straight decision, falling to 32-12-7-0. Mississauga outshot Niagara 44-30 as the Steelheads sit fifth in the Eastern Conference with a 24-21-5-1 record. The win is Mississauga’s third in five games against Niagara this season. First-year forward Kaleb Pearson (9, 10) scored a pair of early first period goals, giving the Owen Sound Attack a running start in a 4-2 road win over the Barrie Colts. The Attack’s second straight win also included markers from Barret Kirwin (14) on a penalty shot for the game winner before defenceman Carter Robertson (2) added third period insurance. Maksim Sushko finished with two assists while Mack Guzda made 29 saves in goal. Jacob Tortora (14) and Jason Willms (11) scored Barrie goals while Jet Greaves turned aside 30 shots in the loss. The Attack stay in the thick of things in the Western Conference, improving to 25-22-2-2 for fifth. Barrie sits six points back of eighth place Hamilton in the Eastern Conference, falling to 21-26-2-1. With school buses cancelled ahead of a School Day game, Hamilton fans were treated to a shootout for free on Thursday morning as Brandon Saigeon and Kyle MacLean scored the deciding goals in a 5-4 Oshawa Generals road win. MacLean (14), Allan McShane (24) and Serron Noel (27) scored in regulation for Oshawa, with Noel netting the tying goal on a power play with 4:13 left in the third period. Overage standout Anthony Salinitri finished with three assists while former Bulldog Nicolas Mattinen had a pair of his own. The Bulldogs outshot the Generals 29-23 as captain Matthew Strome (23, 24) scored twice, joining rookie Logan Morrison (7) in the goal scoring department. Oshawa’s Aidan Hughes made 26 saves in the win, helping the Generals earn a point in a fourth straight game and improve to 31-18-3-0. Hamilton drops a fourth straight contest, falling to 23-24-3-2.